As we parted ways with Olga and she headed to the beach, myself and Ramlan decided to skip some serious miles by getting a night bus north to Mandalay. I would quite like the two hours back it took me to cycle through Yangon traffic to the bus station 20km out of town at night back. I didn’t like it. Someone knocked my panniers off and as it’s not cool to get angry here I managed to hold my cool. I’d also like the week of my life back after eating something that was apparently fish but looked like chicken that I ate in Yangon bus station. More on that in a minute. The VIP night bus was smooth and zipped us to Mandalay by 5am, even including a free toothbrush. We cycled the 5km or so into town to check in at the ace Ace Hostel by 6am. Which was good timing as at about 6:10am I started several days of aggressive toileting. 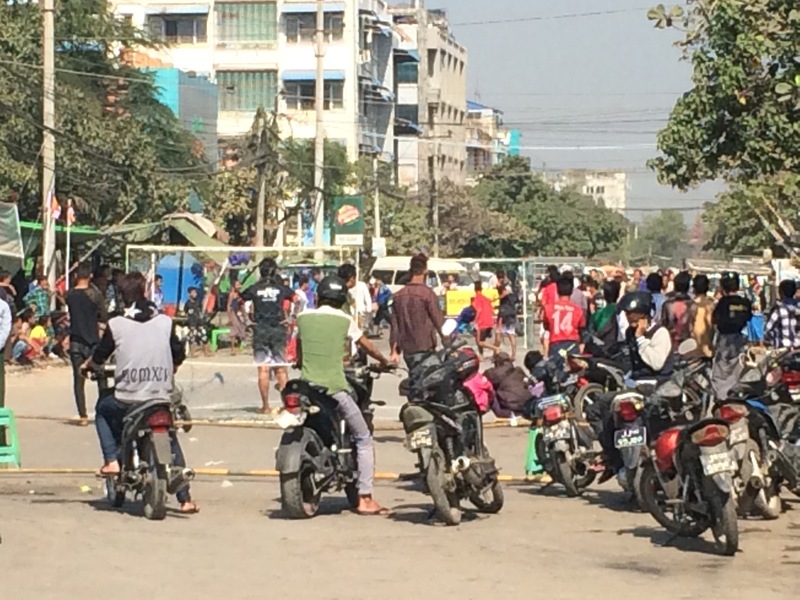 I can’t comment about anything really about Mandalay as I was in the hotel pretty much exclusively apart from ambitiously trying to leave a day earlier before realising that wasn’t wise. 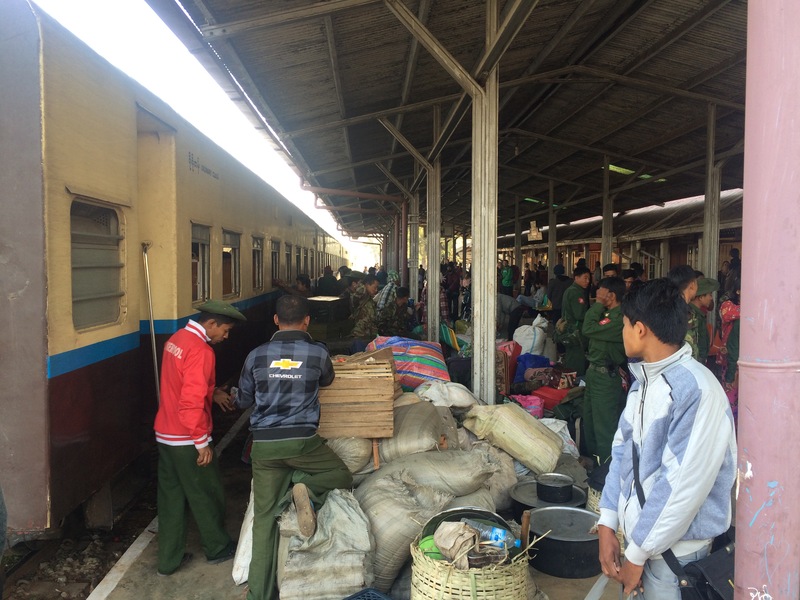 The train to Mandalay leaves at 4am and helpfully we were only a few hundred metres away as it was fair to say I was still a touch fragile. 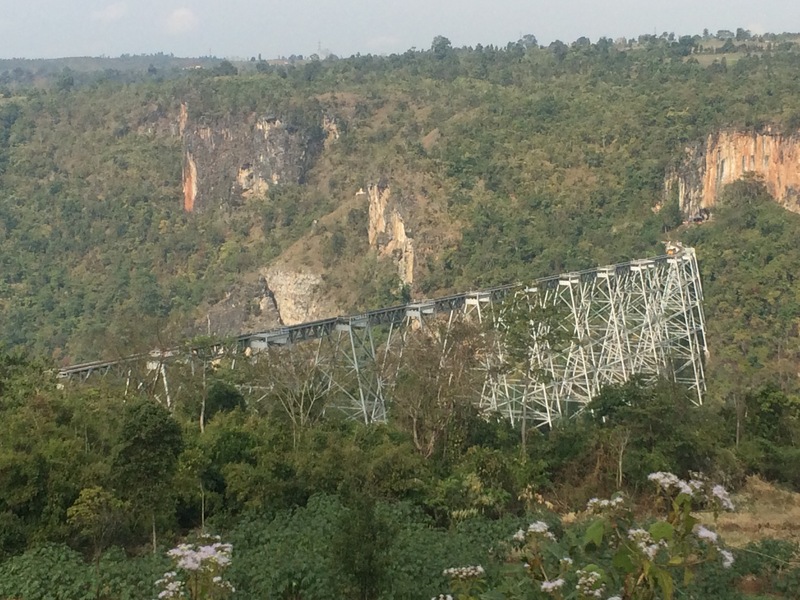 The train takes 14 hours to cover about 300km into the eastern Shan state as the train network isn’t quite advancing into the modern era as fast as the rest of Myanmar is. But it was a very charismatic and scenic journey that I would most heartily recommend. It also only cost about £2 plus a bit extra for the bikes. 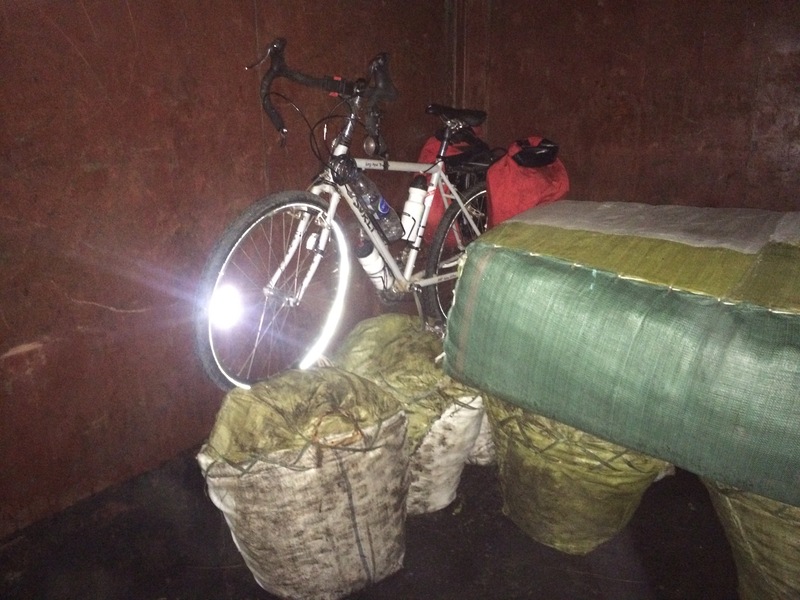 The bikes were loaded into the storage compartments with some massive sacks and later goats. Turns out the sacks were dried fish and gave the contents of my panniers a bit of an aroma for a day or so. 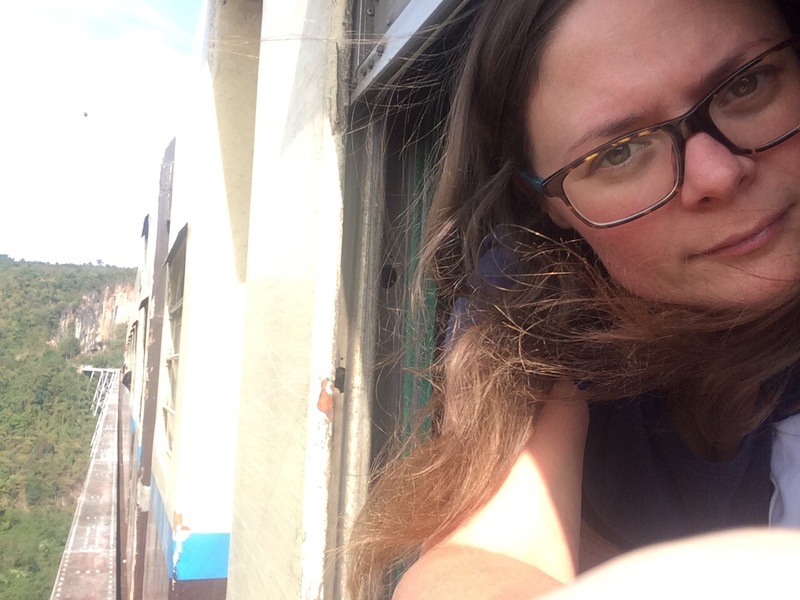 The train stopped at several towns and smaller stations along the way where locals and tourists (it’s a popular ride) hop on and off and happily hang around while carriages are connected and goods are loaded on and off along the way. 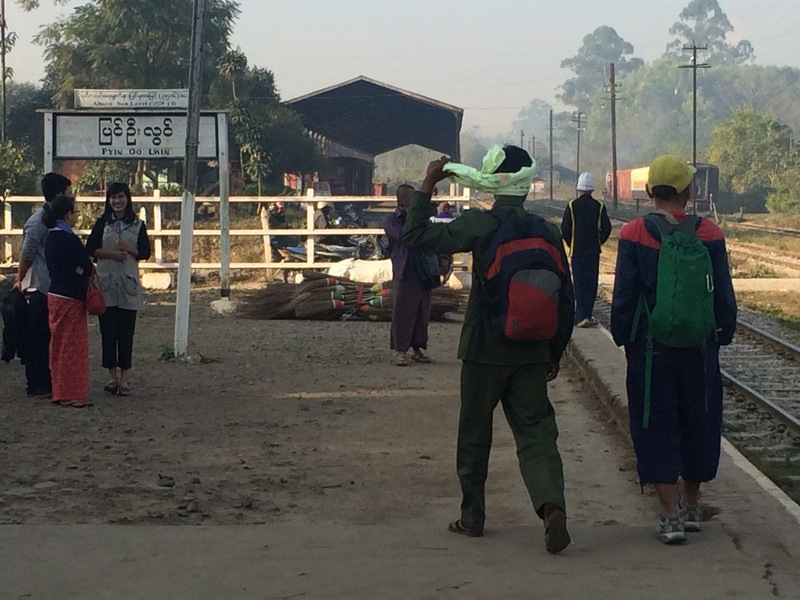 In particular we passed through the station of Pyin-of-Lwin, a town that was a key colonial location (not sure why) and the station most definitely still evidences it’s history… Again the clash of old and new is there right before your eyes. I find it so interesting. 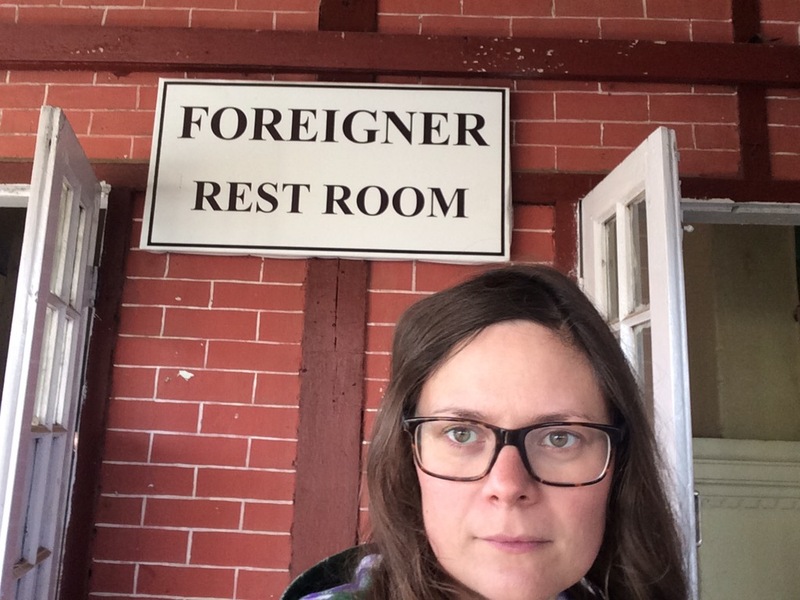 Special room for the foreigners from back in the very socially divided colonial days. Even a sit down loo. 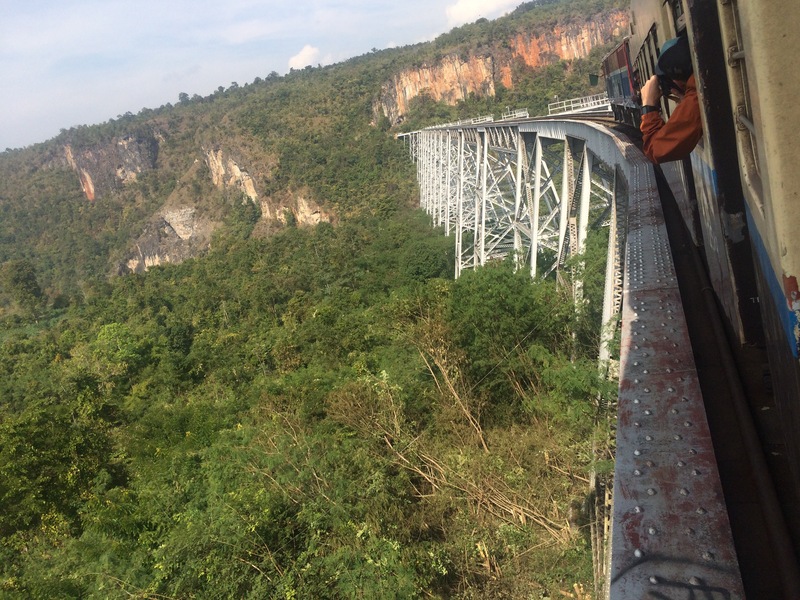 The major highlight of the journey is the passing of the Giotek viaduct, an old school and impressive structure that takes the train over a demon of a gorge and is most certainly worth hanging your neck out of the window and getting paparazzi with the scenery for. Many people get the train just to the viaduct and then head back in the other direction. 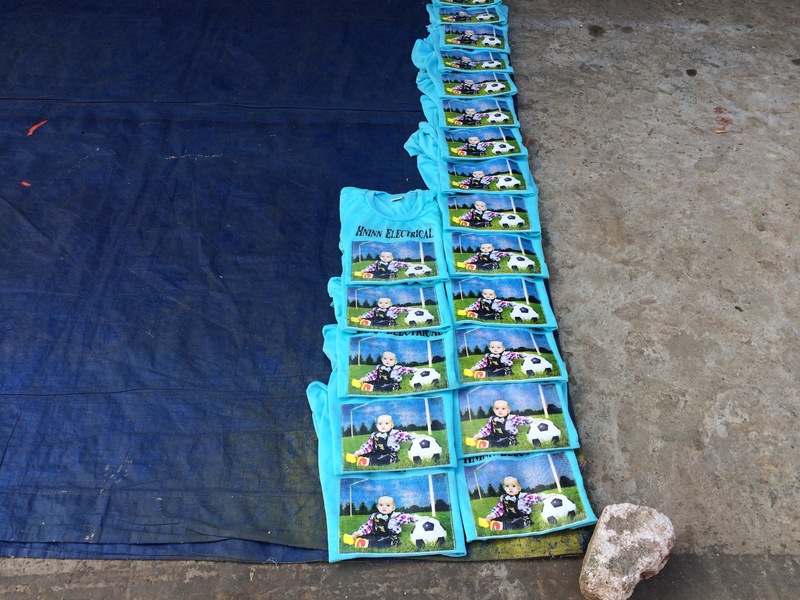 The last couple of hours did drag a little and I was pleased for us to arrive in Hsipaw. There is a real satisfaction on arrival of skipping away on your bike much to the confusion of people and being able to politely decline the endless offers of taxis. 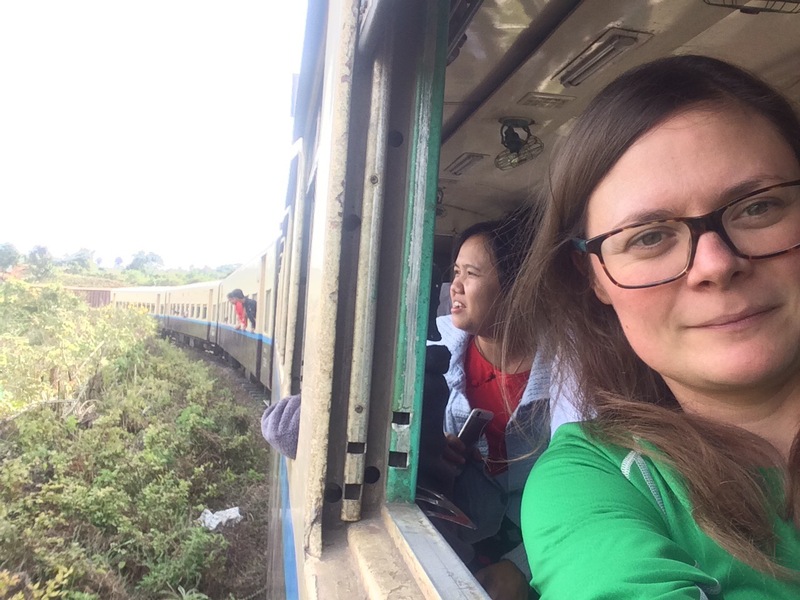 On the train we were approached by a young salesperson for one of the hotels who inventively got on the train one stop before Hsipaw to persuade tourists without a booking to stay at their hotel. It worked pretty well and we ended up staying at the Red Dragon. 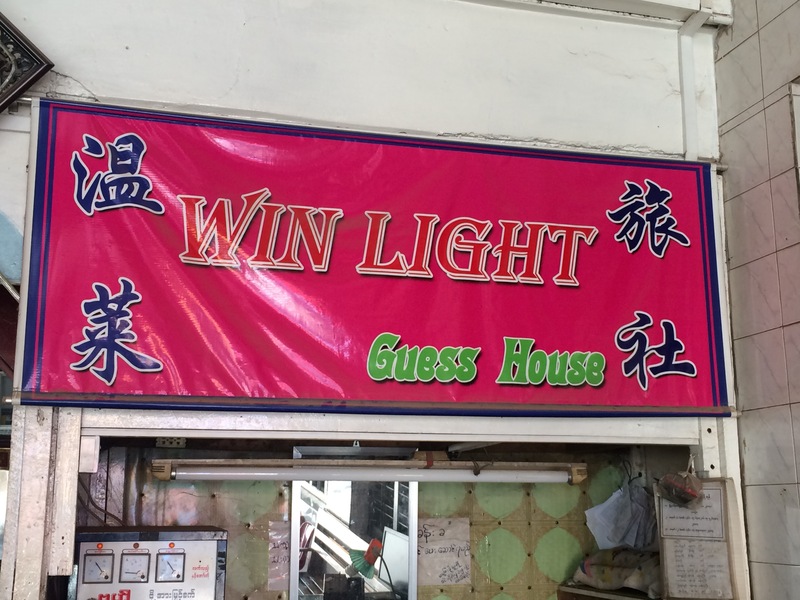 Apparently there is a bit of a monopoly on guesthouses and trekking companies in the town, so the diversification is perhaps a good thing. We were told along the way somewhere that over the past ten-fifteen years ago when the powers of the military have been gradually diluted and that the country has been opened up more to tourist that the rights to hotels that can host foreigners were given to former military families. So it’s definitely a good idea to avoid these hotels and monopolies where possible). 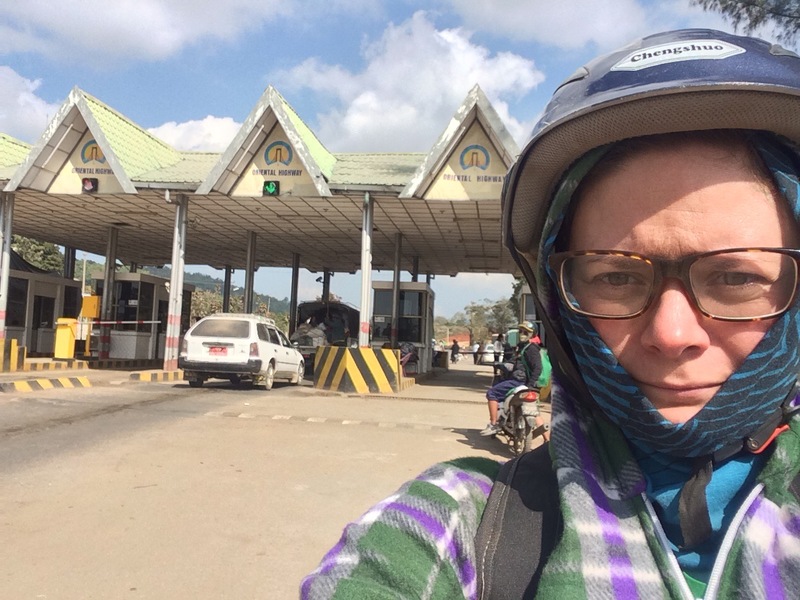 In Hsipaw I was still feeling not so good and still hardly eating and so it wasn’t the most adventurous time and we ended up staying three days (longer than expected). 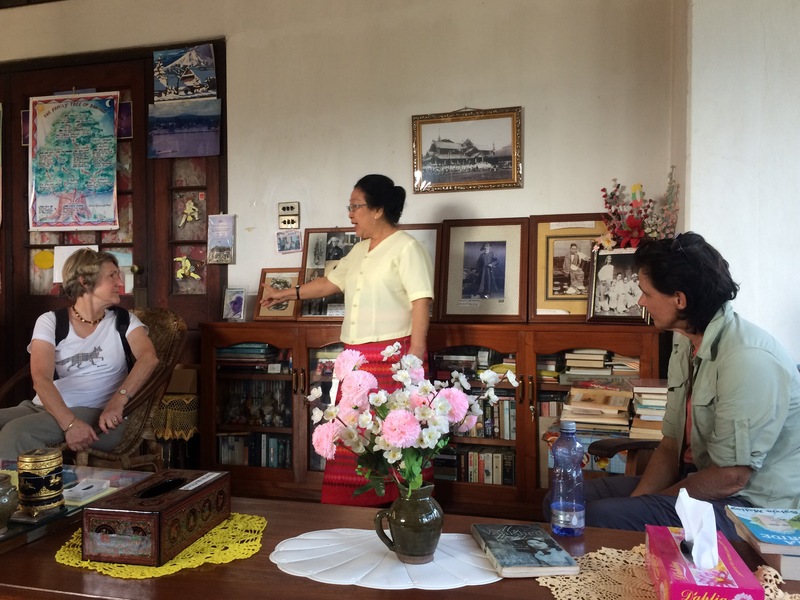 Key highlight in Hsipaw itself was to visit the former palace of a Shan prince where we heard the story of the prince’s disappearance (read execution) at the hands of the military many decades back and as told by a living family member, Fern, still living in the house. It was fascinating and absolutely worth a visit. 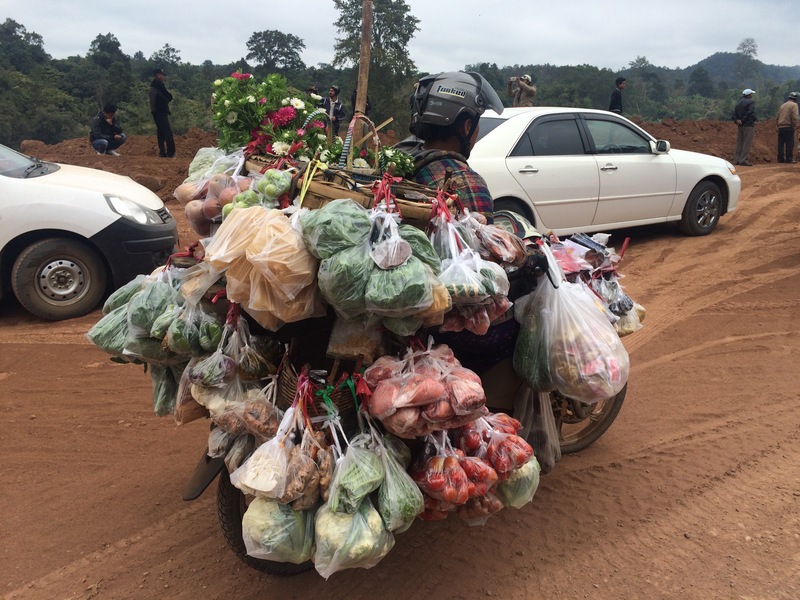 When I was back to almost normal health we hired motorbikes and bombed 70km though the Shan hills to the next big town of Lashio. We were pretty Far East by this point and only about 100km from the Chinese border. The the town was a weaving, windy network of hilly roads with a very clear Chinese influence so close to the border. Many signs were in four languages, of Myanmar, English, Shan and Mandarin. Here we ate an absolutely delicious Chinese lunch in a very modest looking restaurant but nearly passed out at the price which was almost UK like. The ride was very memorable with the particular shapings of the Shan hills, almost hillock like, and also because it was ruddy freezing on the bike with the wind in the hills. Got back to the hotel after accidentally losing Ramlan and let myself defrost. 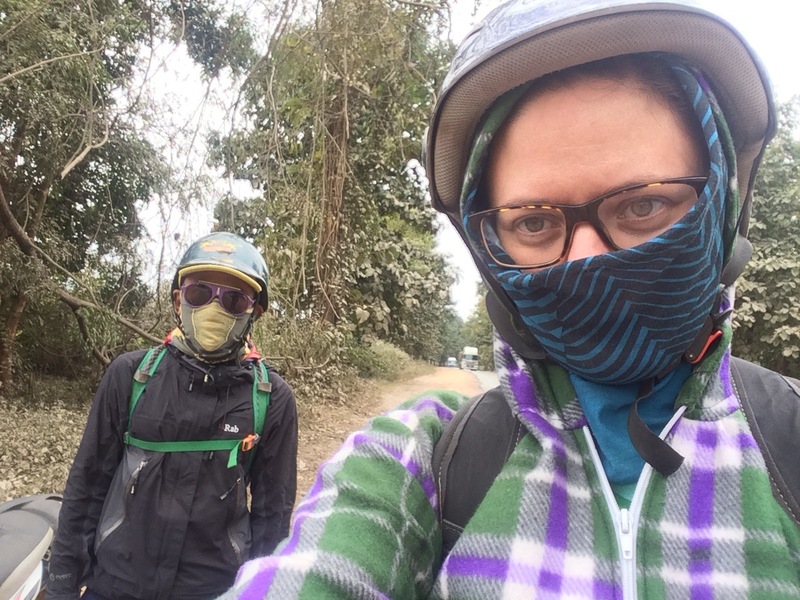 Despite my protestations that I wanted to cycle and I wanted to cycle now, we didn’t cycle and instead got the bus to Pyin-oo-Lwin with the intention of staying one night and then cycling (mostly downhill) back to Mandalay. I’d spent days while I’ll looking into easier cycling routes as I was desperate to get off buses, but unfortunately by not eating properly and not cycling for what felt like ages I just didn’t feel strong enough. It’s not like you can just hop on and go, you kind of have to be pretty fit to manage the heat and the hills and carrying the weight, so I felt pretty disappointed. 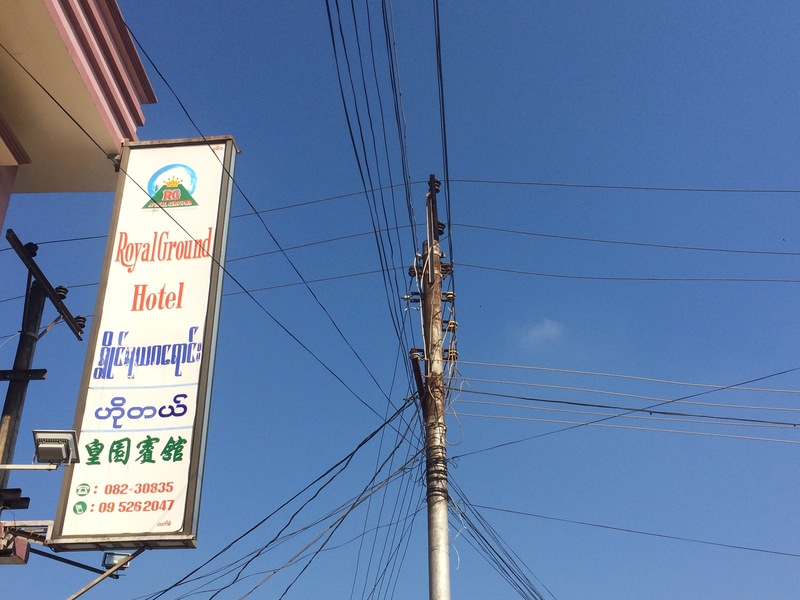 So we got a fairly priced bus and got overcharged for putting the bikes on (no choice at this point) to Pyin-oo-Lwin. Upon reaching the town we tried five hotels and everywhere was full for a national holiday. The only place left was a one room shared with another two people and it was really skanky, so Ramlan had the bright idea of getting another bus to Mandalay to save time and give us another day somewhere else. I relinquished the idea of cycling again and agreed this was a good idea as our visas were running out and hadn’t even been the the two main tourist spots yet. So we were in Mandalay by evening and on a bus the next day to Bagan, the pearl of Myanmar and the 8th wonder of the world. 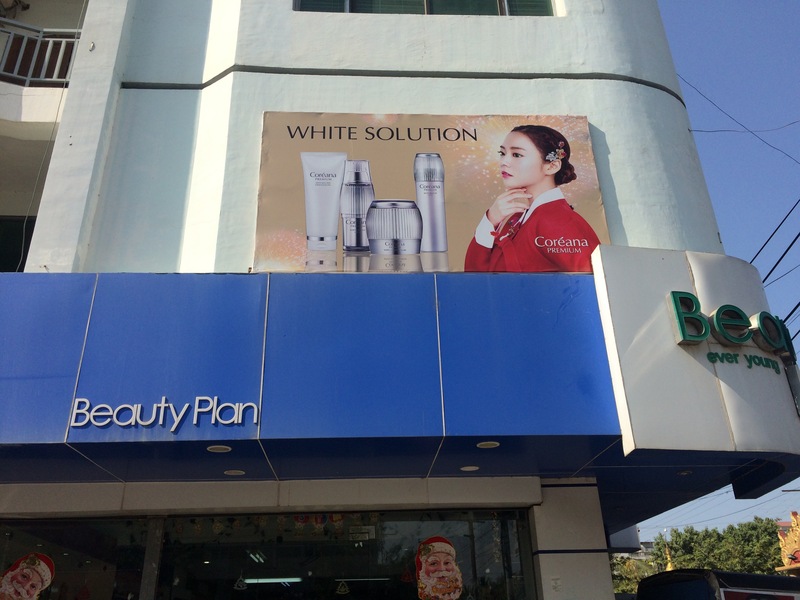 Beauty plan. Be white. Advert for skin bleahaching cream.